I’m leaving on a jet plane; don’t know when I’ll be back again. No, not really. I do know when I’ll be back again. But the thing you need to know now is that I’m leaving…right now…today…to go to Houston, Texas, for the LPM Siesta Scripture Memory Challenge Celebration with Beth Moore and the gang. Back in January ’09 she issued a challenge on her blog for women to memorize two scripture passages a month for one year. 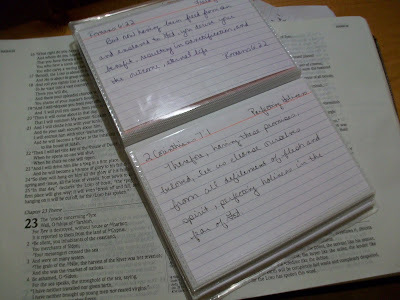 We were supposed to post our chosen scriptures passages on the LPM blog on the 1st and 15th of each month, write our scriptures on index cards and keep them in a booklet, meditate on them and memorize them. It really was just a personal challenge at that point, no reward in sight other than the amazing personal rewards of having God’s breathing, powerful Word in your heart doing its thing. But then, around June I think, Beth was so pleased with the number of women who were hanging in there with the challenge, that she offered a free Living Proof Live Conference to those who completed the year. So at that point you pretty much had to already be on board to complete enough scriptures to qualify. And I did it!!!! I memorized and nailed down 24 scriptures passages, some of them including 2-4 verses. I sometimes need someone to give me the first word of the passage to get me started and I inevitably struggle with the address, but these mighty words are planted deep in my heart and in the thick of my brain. I’m thrilled to be going to this Living Proof Live event with about 500 other women from all over the country (with a nice room at the Omni Hotel thrown in for good measure), but I’m ecstatic about having these verses under my belt. These scriptures have literally changed my thinking. Each day I use Psalm 90:17 to ask God to give significance to my work and give me His favor. I remind myself of the sweetness of God’s Word to my taste when I say Jeremiah 15:16. I use 2 Corinthians 7:1 to remind me to quit critiquing other people’s lives and mistakes and instead to concentrate on perfecting holiness in my own life. Jeremiah 6:16, my theme verse for this blog, reminds me that I have a choice as to which path I’ll take each day. One will give rest to my soul; the other will lead to no where good. I’ve memorized all of Psalm 121 so I can remember that my Protector is ever mindful of me and will not let me fall into harms way. First Timothy 6:6 is the verse that helps me practice contentment each day. Jonah 2:8 reminds me that if I want a full dose of God’s grace I better let go of the worthless idols I’ve clung to in the past. Proverbs 14:26 reminds me that my personal relationship with God can serve as a refuge for my children when they hit rough spots in their paths. When I remember John 6:27 I’m reminded to choose the eternal food that satisfies my soul rather than the cotton candy the world offers me. Likewise, John 4:14 directs me to drink from the Living Water rather than running to one broken cistern after another in an attempt to quench my soul thirsts. When I watch the news at night and become disheartened by the world around me, Nehemiah 4:14b encourages me not to be afraid, but to fight for my family and my home. And Isaiah 58:10-11 assures me that if I give generously to my family and others who need what I have, then God will replenish my supply and keep me flourishing. Please consider storing up God’s Word in your heart too. Start small. One verse here, one there. Choose scriptures that minister to your current needs. Meditate on them, digest them, and lock them in so they will continue to produce fruit in your life for years to come. At least I hope mine will stay in there for years! Second, please pray for me and the other 500 Siestas who will be journeying to Houston this weekend. Pray for traveling safety and wellness, but most importantly pray for a mighty outpouring of God’s presence and direction for us as we hear a word from our hostess, Beth Moore. Well, I’d write more, but I gotta get on that jet plane! I’d love for you to tell me a special verse that has ministered to you recently. You never know, maybe I’ll try to memorize it too!